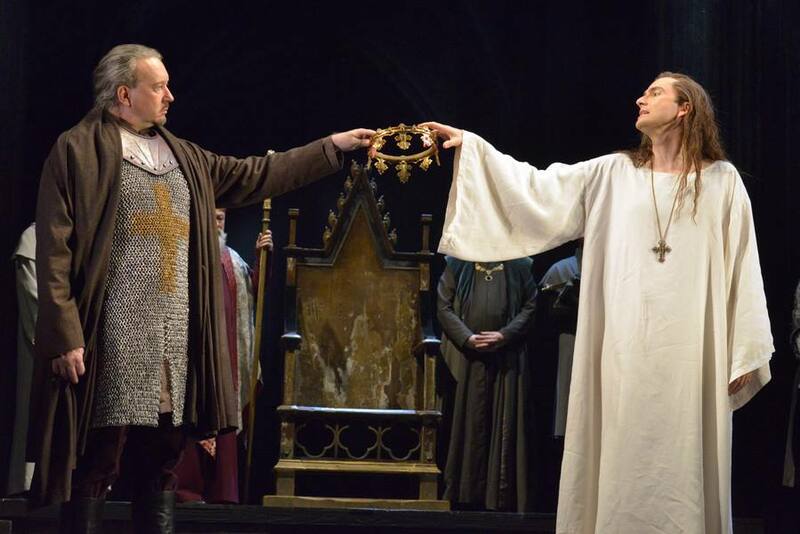 It has been quite a while since I first saw the RSC’s Richard II with David Tennant and the production has certainly come a long way since that first preview in October 2013 in Stratford-Upon-Avon. This weekend saw its return to the Barbican for only nine performances (four now remain, as part of the four King & Country cycles running over the next two weeks). I was curious to see how it would compare with the previous incarnation. In my opinion, this production has only grown stronger with the changes. There are some actors I miss but, overall, of the two versions this is the stronger and it’s a shame there isn’t more time for the ensemble to really bed in and strengthen it further. It is a testament to the quality and confidence of this ensemble (most of whom have been with the RSC through all three Histories) that it is so good straight off the mark. As regular readers of this blog know, two years ago I gave my thoughts after the first two previews of the production and then later reviewed the production after it opened, (as well as reviewing the superb understudy run). However, I was so impressed with the show this weekend (yes I did go more than once and will be seeing it again), that I thought it would be interesting to consider the changes that have been made (whether significant or subtle), which will be something for me to look back on and hopefully prove of interest to anyone unable to see this run. This will therefore be longer than my usual theatre reviews. The fact that only nine actors from the original production have returned (and one of those not in the same role) means that this was always going to feel like a new interpretation and of all the casting changes, the biggest difference comes from Jasper Britton’s Bolingbroke. After playing King Henry IV for so long in the next play of the cycle, it is wonderful to see such a superb actor in this role (which let’s face it, is the more interesting part of the character’s story arc). Britton is utterly superb. From the end of scene one I knew this was going to be an impressive performance. I did enjoy Nigel Lindsay’s portrayal, but Britton simply breathes Bolingbroke and gave a different slant on the role to Lindsay. In the original run, I always thought it seemed as if Bolingbroke becomes King by accident. Events get away from him. Not so here. Britton’s Bolingbroke is not a fan of Richard from the beginning and on his exile you sense he will be back for power. He wants to bring Richard down from his lofty position and will achieve it. Britton’s time as Henry IV only makes his portrayal here richer, with subtle changes adding depth to the character. His rage in the opening scene at the death of his uncle Gloucester, his bubbling anger on being exiled, stamping the floor in defiance (once so hard he damaged the stage! ), make clear his mind. The sun shall indeed be shining on him in exile and had Richard not disinherited him, you sense he would still have returned with an army behind him. He also enhances the relationship between Henry, Northumberland (Sean Chapman) and Harry Percy (Matthew Needham), the two who will take part in plotting his downfall not too far in the future. In one moment, he takes both of their hands, affirming their bond, which carries a wonderful irony when you know what is to come in the next play. He also adds humour to places I hadn’t expected – pretending not to be himself to confuse Harry Percy is a lovely touch, which also makes him likeable and human, as well as being a force to be feared. With such a strong stage presence and with so much ease with the text, he is a joy to watch and I’m sorry he won’t have longer to play this role. The other significant cast change is that of Aumerle, who is so pivotal in this production. I loved Oliver Rix’s performance, which developed so much over the run, adding layers of emotional depth to the character. 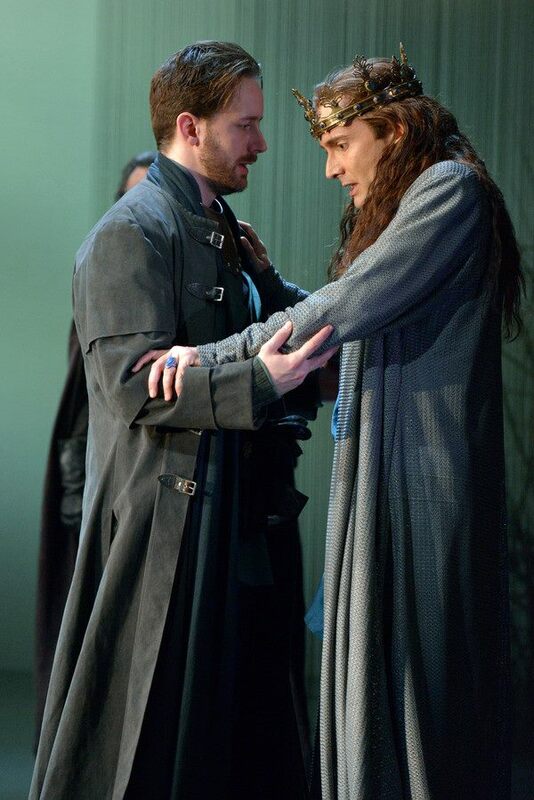 I admit I was sorry he wasn’t returning, but also felt sure that Sam Marks was the only choice to replace him (after seeing his Aumerle against Rix’s Richard in the understudy performance). Sam is a fine Aumerle and has already begun to settle and grow in the role over a few short performances. I have always found Aumerle’s journey in this production interesting to watch, as he is always conflicted no matter what is happening around him. Sam plays this sense of conflict wonderfully, right from the start. In the moments before his duel with Mowbray, there is real warmth between Bolingbroke and Aumerle, suggesting they are quite close. However Aumerle is noticeably uncomfortable on seeing Richard’s expression of disapproval (and perhaps jealousy) as he watches from on high. Aumerle’s own disapproval and horror at Richard’s treatment of Gaunt’s possessions on his death is clear and yet he is still viewed as Richard’s ally by Northumberland and his men in those moments. As the production moves to its conclusion, his ultimate conflict as to where he fits in to this new order, leads to his final tragic actions, which if you focus on him from the beginning becomes all the more moving by the end. For me, it is Aumerle’s journey in the play that is the most tragic. Yes Richard loses his crown and finally his life, but Aumerle loses everything and everyone he cares about, before finally losing himself through his final terrible choice. The more I see this choice of ending for Richard II, the more I see how perfectly it fits and I wouldn’t be surprise if this is the ending Shakespeare had always intended. Sam is also wonderfully developing the emotional connection needed between him and David Tennant’s Richard to give the end its impact and his bond with Richard on his return from Ireland is clear. Then there is Flint Castle – which has always been my favourite scene of this production. Thankfully it remains just as powerful, if not more so, with Sam Marks and David Tennant having even more of a charged, beautiful, tender connection than Tennant and Rix managed to build. I can only imagine how incredibly electric this would become after three months, when it is already so good after five performances. Their intimacy and affection on that castle wall, as they hold one another, makes Richard’s acceptance of defeat even more upsetting after this point of true connection with another person, perhaps the most affection he has ever experienced in his life. Later, on Aumerle’s own unravelling when his treason is discovered by his father, Sam Marks crumbles before the audience’s eyes. It’s a very affecting moment (or still was for me). Oh how I wish this was also recorded, even if just in the archives. He is an absolutely, worthy successor to a character and a portrayal that I loved so much originally. Watching him grow as an actor over the last two years with the RSC has been a joy and I look forward to seeing him in many more roles to come. In terms of other casting changes, Julian Glover’s Gaunt has a nice relationship with Britton’s Bolingbroke, but he lacks the stage presence of Michael Pennington, whose “Sceptred Isle” speech was always beautiful. Matthew Needham’s Harry Percy is a wound cog, aching for a bloody battle and I look forward to seeing his Hotspur next week. Leigh Quinn’s Queen has a tenderer bond with Richard making their parting sadder than before. Sarah Park’s Duchess of York is a feistier woman than Marty Cruickshank’s was and although these later scenes still carry their humour, she doesn’t quite have the same comedic double-act with Oliver Ford Davies as Cruickshank did. I was also impressed by Robert Gilbert, playing Greene (but also others later on) and I’ll keep my eye out for him in the future. I do miss Anthony Byrne as Mowbray and would have loved to see him confronting Britton’s Bolingbroke. In terms of significant scene changes there are only really two with substantive differences, both of which work much better than in the original production. The scene in which Aumerle is pardoned now sets up what is to follow even more clearly than before. The King hands him his own dagger on pardoning him, assumedly to indicate that he doesn’t view him as a threat. Seeing Aumerle looking at that dagger you can almost sense his train of thought. On top of that, on receiving some written news (I assume news of more plotting by Richard’s supporters), King Henry gives the line “Have I no friend will rid me of this living fear?” while thrusting the paper at Aumerle, who walks off reading it intently. This character, who has always been so conflicted, now has all he needs to make his final tragic decision and I thought it worked very well. The prison scene is the most altered. Gone is the below-stage pit. Instead Richard arrives from the back of the stage, chained to posts, with the stage becoming the bottom of a dark, dank cell. This means Tennant is fully visible, centre stage, as he gives those final lines and Aumerle’s final act takes place. I also loved how the dead king slips to the back of the stage, as the new king descends directly above. The imagery of the two, one laid out dead and the other enthroned is quite eerie and perfectly depicts the transient nature of the crown at that point. Other changes are, I imagine, due to choices made by the actors. I particularly love the tweak to the final moments, with Bolingbroke now looking up in terror, as if he really can see Richard’s ghost looking down, as he removes the crown from his head and clutches it, as York looks on as if wondering what it is the King thinks he sees. This gives the end a strong, powerful beat, which perfectly sets up the beginning of Henry IV. All of the returning actors are excellent; bringing their developed knowledge and understanding of these characters, for some built over four plays, with them. Sean Chapman continues to impress as the intimidating Northumberland; Simon Thorp is wonderful as Salisbury (what a fabulous voice he has) to highlight just two. Oliver Ford Davies is of course still brilliant as York. Watching him perform Shakespeare is a masterclass of quality for me every single time. 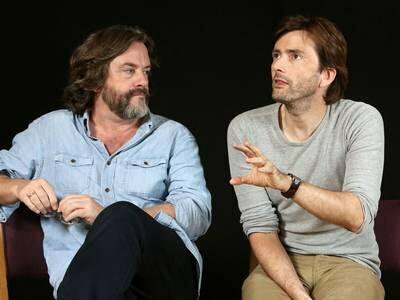 As for Mr. Tennant, he has clearly thought about all the aspects of his performance that he could improve and has done exactly that, meaning his Richard is now even stronger than ever. It’s a million miles from that first preview (after which I was somewhat disappointed). Every bored expression during those early scenes is subtle and spot on. Richard’s sense of entitlement at his position could not be clearer! The “Death of Kings” speech is beautiful – no over the top insistence on them sitting down from him (which often elicited laughs from the audience). Now Richard says this as a man in utter despair, exhausted by his world. There was silence in the theatre each time. I’ve already praised the Flint Castle scene already, but Tennant has honed those final quiet moments of reflection to perfection. The way he drags the crown towards himself, scraping it against the metal of the gangway, creating the only sound after such a tender moment with Aumerle and his expression as he gazes at it, before finally releasing a heavy sigh is still incredibly poignant. You don’t need words to know exactly what he is feeling in that moment. It is utterly magical. He has also thought more about the deposition scene, which was already fantastic to watch. He and Jasper Britton are so wonderful together and I love how his reluctance to resign the crown is clearer. As well as his changing of his mind to hand over the crown, David now adds in a few exhales of breath, as if Richard is psyching himself up to saying the words “I resign to thee” to Henry. It was clear throughout the production that Tennant was giving his entire performance everything he had. After returning home yesterday and thinking about the production, I couldn’t help but think of the Cumberbatch Hamlet, that being the last Shakespeare I saw on the Barbican stage beforehand. 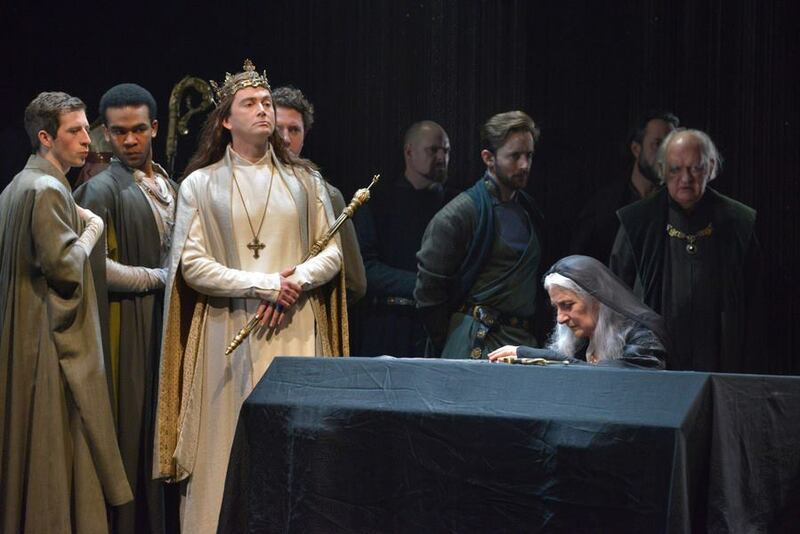 Although I thought Benedict did a great job (and he remains one of the finest actors in my mind), everything that frustrated me about that production was emphasized by seeing its exact opposite in Richard II. You don’t need a big set, lots of needless props, or people moving in slow motion in the background during pivotal speeches to create an impressive production. All you need is solid direction and a set of actors who have the understanding of the text and therefore the confidence to sell it emotionally. Get that right and it’s spellbinding. For me, that’s something that sets the RSC apart from other Shakespeare and will keep me returning again and again (with or without Mr. Tennant). I look forward to saying farewell to this production in London next week and then saying a final farewell at its final performance in New York in April. No doubt I’ll write about that here too. Richard II has four remaining performances at the Barbican – Tuesday 12th, Friday 15th, Tuesday 19th and Friday 22nd January. The Barbican has started to release tickets for all four cycle plays separately, so keep an eye on the website for any last minute returns or try for day seats / returns on the day. Theatre To See in 2016! 2016 has arrived, so it’s the time of year for theatregoers when we start planning all the shows we need to book for the new year, while pondering what rumours are circulating as to productions that may arrive during the next twelve months. This post has been a great way of organising my own theatregoing, as I see what I’ve yet to book while compiling this list of recommendations! 2015 was an excellent year for me for theatre (read my review of the year here) and I certainly hope 2016 proves to be even better. So, here are the productions I’m most looking forward to in 2016. I am planning a New York trip in April, but as I’m not yet sure what I will be seeing this list is purely a UK selection and admittedly mainly London-based (although I plan to get to regional theatre more again this year). The forthcoming production of Sunset Boulevard is my most anticipated show of 2016 so far. It’s a musical I’ve never seen, I’ve never been to the London Coliseum before (this year I’m determined to visit more theatres) and it means I’ll get to see Glenn Close, an actress I greatly admire, on stage. Returning to a role she played back in 1994 on Broadway, tickets for this production’s five week run have been incredibly popular since going on sale last year, but there are still some available. Although I’ve already seen this production during its last run in 2013, as a huge fan of Mr Tennant, especially for Shakespeare (something he seems to effortlessly make modern and accessible to all), I had to include this return of Richard II to the Barbican as part of the King & Country cycle. I am rather sad that Oliver Rix is not returning as Aumerle (who I thought was truly superb last time), but Samuel Marks will no doubt do a fantastic job in his place. Tickets are sold out for the individual performances, but returns are worth looking for. Another production coming to the Barbican which has been on my radar for some time is the latest work involving theatre company Complicite. Directed and performed by Simon McBurney this solo show will transport the audience to the Amazonian rainforest, through sound design to weave McBurney’s story with that of Loren McIntyre, a photographer who became lost in the Amazon in 1969. This wouldn’t normally be my type of theatre, but anything involving Complicite (whose A Disappearing Number and Master and Margarita in 2010 and 2012 respectively I loved) will get my attention. I’m sure this will be a unique experience. After missing this highly regarded production during its initial run at the National Theatre, I’m thrilled it has a second lease of life in the West End. A new collaboration between the National and Headlong following Earthquakes in London and The Effect, the play introduces us to Emma, currently in rehab, but who thinks it’s the rest of the world that has the problem. I’ve heard nothing but positive comments about this play and the performance of its lead Denise Gough, so I’m looking forward to seeing this at the Wyndham’s. This play was on my list for 2015, in the hope it might arrive by the end of the year. That didn’t happen, but in their New Year’s Eve video message, the dynamic duo of Patrick Stewart and Ian McKellen announced that this production (which played with Waiting For Godot in New York in 2013) would be in London this September. They are both such wonderful actors, but there is something very special seeing them together. If I enjoy this half as much as Waiting For Godot in 2009, I’ll be very happy indeed. There is so much about this production which makes it a top choice for 2016. For a start, the ensemble cast contains some brilliant talent including Vanessa Kirby (most recently of the Young Vic’s Streetcar) and Tobias Menzies (whose one man performance in The Fever last year was superb). On top of that is the involvement of Robert Icke, whose production of Oresteia last year topped virtually every theatre list of 2015 (including mine). As with that play, this will be a new interpretation of Chekhov’s Uncle Vanya by Icke, which he will also direct. Expectation as to what he will come up with next is incredibly high, so I hope this delivers. I’ve only seen one previous production of this August Strindberg play, which was the Young Vic’s 2012 version starring Natalie Dormer and it was one I have not forgotten, due to the power of the story and the emotionally charged atmosphere in which it takes place. As that production was also based on the adaptation by Patrick Marber to be used here, I’m thrilled to be able to see it again, with Helen George in the main role. Known to most through Call The Midwife, this role will give her room to show a very different side and I’m looking forward to seeing this in Bath or during the subsequent tour. Another production I was sorry to miss last year was Nell Gwynn at the Globe. Although there has been a change of lead actress (with Gemma Arterton replacing Gugu Mbatha-Raw), I’m very much looking forward to a show which many people I know said was a highlight of their theatre year and learning more about the woman who went on to become Britain’s most celebrated actress (and mistress to King Charles II). The first 2016 production for the Old Vic looks to be very promising, seeing Ralph Fiennes in the lead role of this Ibsen play. After seeing his brilliant performance in Man & Superman last year, I can’t wait to see Mr. Fiennes on stage again and in this new adaptation by David Hare (most recently having enjoyed success both in London and New York with Skylight), it should be very memorable. After the success of One Man, Two Guvnors, this is the new comedy from Richard Bean. If that wasn’t enough to get excited about, it’s directed by actor Richard Wilson and stars rising British Hollywood star Jack O’Connell as a young, Sheffield-born snooker player. As this is running in the home of snooker at the Crucible I imagine this will add to the atmosphere of this production and is a fantastic part of Sheffield Theatres wonderful 2016 season. As it’s been 15 years since this play by Simon Stephens was last in London, I have yet to see it and although I find his work a bit of a mixed bag of enjoyment (last year’s Carmen Disruption was not for me), he’s a playwright whose plays I will always book a ticket to see. Described as an unflinching and incendiary play, I imagine this will not be an easy one to watch, but I hope it will be as powerful as some of his other plays that I have loved. This is the only show I have booked for the new Donmar season and the reason is I’m very much looking forward to seeing the next play by Nick Payne, whose constellations has done so well on both sides of the Atlantic in recent years. Set in a near-future where advances in science mean it’s possible to “augment and extend life”, I’m expecting this to be a thought-provoking production. Although I do tend to see more plays than musicals, I’ve been looking forward to the arrival from Broadway of Disney’s Aladdin, which had been on my list of things to see in NYC. A Disney musical done well is always good fun and Aladdin already has the advantage of having a strong set of songs from start to finish. Terence Rattigan remains one of my favourite playwrights and I very much enjoyed the last production of The Deep Blue Sea that I saw in Chichester in 2011. Very little is known yet about this forthcoming production at the National, which will be directed by Carrie Cracknell (whose A Doll’s House at the Young Vic was superb), but I’m certainly hopeful for some wonderful casting. Watch this space. I admit I’m not a Harry Potter fanatic and booked a ticket for this play more out of curiosity than anything else. It’s already had record-breaking ticket sales and is booking until mid-2017, so there is certainly a lot of expectation surrounding the next instalment in J.K Rowling’s universe, set 19 years after the last book. I am very excited though about the recently announced casting, as Jamie Parker has been one of my favourites for a few years and Noma Dumesweni is a brilliant actress. This is already set to be the most discussed and anticipated show of the year. After receiving superb reviews last year at the Bristol Old Vic, it’s wonderful that Owen Sheers play, looking at the mental scars of war is coming to London. 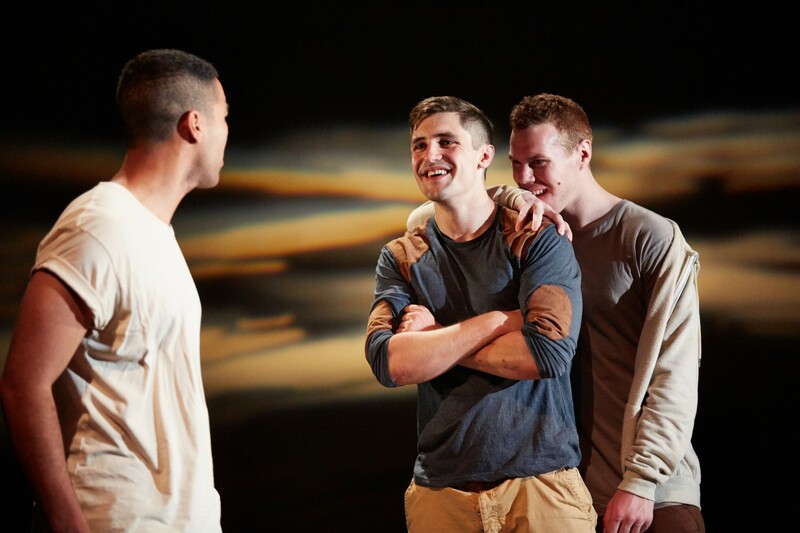 Inspired by interviews with retired servicemen, Pink Mist centres on three young men, deployed to Afghanistan, but whose greatest challenge is then returning to their old lives and loved ones after all they have experienced. I expect this to be an incredibly emotional and profound piece of theatre, which in the current world will have an even bigger impact on audiences. As with any year, there are certain rumours swirling in the theatre air about possible productions arriving in 2016 and I’ll certainly be keeping an eye on the ones below over the next few months. I thoroughly enjoyed the film Finding Neverland and have been hoping this musical adaptation would make its way to London at some point. Nothing has been formally announced yet, although Gary Barlow has said it will be in London this year, so this looks very likely indeed. Those who I know have already seen it in New York were very positive about it and with music and lyrics written by the incredibly talented Mr. Barlow, I’m hopeful this will be a very enjoyable night at the theatre. Martin McDonagh’s latest play, Hangmen, is currently enjoying great success during its West End transfer and so it would be the perfect time to bring one of his earlier plays back to the stage. Rumours last year suggested The Pillowman may indeed make a return, with Colin Morgan linked to the production. I have only ever seen the grainy National Theatre recording of their 2003 production in their archive, but it’s a testament to the power of the piece that it’s still stayed with me. It’s certainly a disturbing and dark play, but I would certainly like the chance to see it live. 3. The Young Chekhov season from Chichester to the National? This triptych of plays was one of the theatre events I was most sorry to miss last year and therefore I’m hoping the rumours of a transfer to the National Theatre prove to be true. In his new adaptations for the Chichester Festival Theatre, David Hare chose to stage two lesser known Chekhov plays (Platonov and Ivanov) in a season with The Seagull. It had a wonderful ensemble including Anna Chanellor, Sam West and Olivia Vinall and the reviews were all excellent. All my fingers are crossed for a second life for these productions in 2016. Catch Them Before They Close….! Although there are now only day seats and returns available, it’s certainly worth making the effort to try and nab a ticket for this new play, housed at the top of a warehouse-style building on Charing Cross Road. A story which imagines what the lives of two famous New York hoarders and recluses must have been like, Richard Greenberg’s play is powerful and emotional and contains two superb performances by two of Britain’s best young talents (Andrew Scott and David Dawson). Read my full review here. As I’ve already mentioned above, this Martin McDonagh play has been widely praised by both critics and theatregoers since it first opened at the Royal Court. After seeing it on its transfer to the West End, it easily made my top ten of 2015. With a brilliant script, wonderful sets and superb acting (particularly Johnny Flynn’s performance), this should be one on everyone’s list for early 2016. Read my full review here. It seems incredible that War Horse is closing in London. It’s become such a fixture since its premiere at the National Theatre in 2007 and move to the New London in 2009, that I expected it to be there forever. Sadly however the show will close on 12th March, before embarking on a UK tour in 2017. There’s certainly something very special about seeing Joey live. He may be a puppet, but the skill of the operators and the beauty of the story means that that is irrelevant. If you haven’t got round to going or want to see it again, make sure you book while you can. I already have my ticket for the last performance. Another long-standing show closing in early 2016 is Billy Elliot, which has played at the Victoria Palace Theatre for over ten years. After such a successful film, it’s wonderful that the musical adaptation has been received with such warmth over the years. If you’ve yet to experience the story of a young boy’s love of dance, you have until early April to book your ticket. It is eight years since I last saw the show, so I’ll definitely be visiting one last time before then. So, hopefully there will be something within my recommendations to appeal to you (or maybe even more than one). I’d love to pick up some more tips for myself, so do leave a comment about what you are excited about seeing in 2016. Happy theatregoing everyone! Posted on January 8, 2016 Categories TheatreTags 2016 Theatre, After Miss Julie, Aladdin, Almeida Theatre, Barbican, Billy Elliot, Bush Theatre, Colin Morgan, Complicite, Crucible Theatre, David Tennant, Denise Gough, Donmar, Elegy, Finding Neverland, Glenn Close, Hangmen, Harry Potter, Helen George, Herons, Ian McKellen, Jack O'Connell, Jamie Parker, National Theatre, Nell Gwynn, Nick Payne, No Man's Land, Noma Dumezweni, Old Vic, Patrick Stewart, People, Pink Mist, Places & Things, Ralph Fiennes, Richard II, Robert Icke, RSC, Shakespeare's Globe, Sheffield Theatres, Simon Stephens, Sunset Boulevard, The Dazzle, The Deep Blue Sea, The Encounter, The Master Builder, The Nap, The Pillowman, Theatre, Theatre review, Uncle Vanya, War Horse, Young Chekov5 Comments on Theatre To See in 2016!